The shoulder girdle is quite extraordinary. Designed to act as the bridge between the arms and the spine, it provides both delicate strength and immense stability. At its essence, it enables emotion to be transmitted into action; stability into strength, power and endurance. Emotionally, the shoulder girdle is part of a chain of events responsible for hugging, squeezing, reaching out and grasping. Simply by its postural position, the shoulder girdle can express pain, depression, suppression, shock, openness, receptivity, willingness, and/or comfort with one’s own personal power. In the physical practice of yoga, the shoulder girdle has a similar role transmitting and transforming energy by impacting our ability to raise the arms overhead or out to the sides as in Mountain Pose or Warrior 2, respectively. It influences our ability to balance in Crow Pose, Plank Pose, Chatturanga Dandasana and our ability to move our arms into Eagle Pose, Cow Face Pose, Reverse Namaste. In back bends, the shoulder girdle can impact our ability to even get into the pose – think of Wheel Pose. 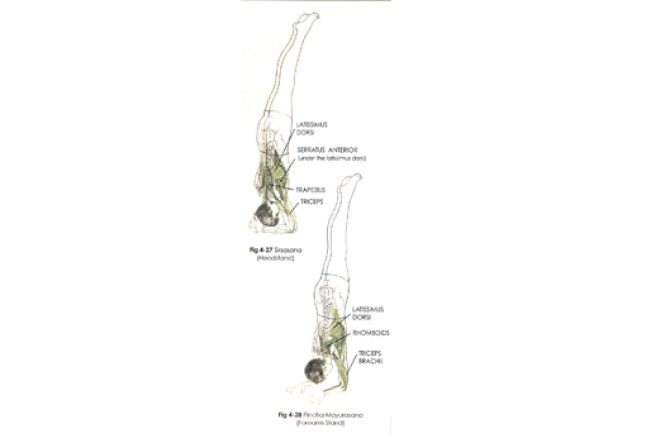 Here, we are delving into the shoulder girdle as it relates to inversions. Inversions take us into an arena that is separate from backbends, forward bends and twists. They shake us up by shifting perspective, posture and muscular coordination. By doing so, they create lightness. As humans, most of our day has us in an upright position, either in standing, sitting, or walking, with a mostly forward facing perspective, feet on the ground. The lower limbs hold the body’s weight and the eyes take in the world that rests in front and to the periphery – this includes the world that exists when looking up, down or to the side. Being upside down shifts that. In an inverted position, the arms and hands work like the legs and feet. Their role changes from one of gesture to one of weight-bearing. The shoulder girdle functions as the pelvic girdle transferring the weight of the body through to the arms and hands. The head becomes limited in its range of motion, so rather than following visual distractions, the line of sight becomes gently focused. This shift in function can create incredible upper body strength. However, if the connection between the shoulder girdle and the spine is dysfunctional it can lead to compression of the cervical vertebrae and repetitive strain issues in the elbows and wrists. The Serratus Anterior is one of those magical muscles. Magical in that it has an equal ability to add or to inhibit optimal functioning of the shoulder girdle. When it is working in balance with the other postural muscles, inversions like headstand, forearm stand and handstand are light, strong and feel amazing. When it is not, inversions can feel like a lesson of frustrating futility (which of course is wrapped in a yogic demeanor of patience). 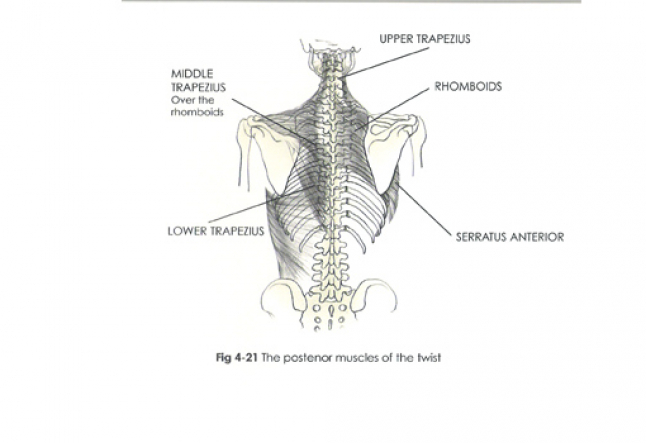 The serratus anterior is located in the area of the scapula and rib cage. Specifically, it attaches to the medial border of the scapula where it connects fascially with both the rhomboids and middle trapezius. From the medial border, the serratus anterior travels under the scapula to the lateral side of the body, hugging the rib cage and attaching onto the 1st-9th ribs. The serratus anterior directly affects the movement of the scapula. When the whole serratus anterior contracts, it pulls the scapula into protraction, as if the scapula was moving forward, under the armpit. When only the upper fibers contract, it pulls the scapula into upward rotation causing the glenoid fossa (the scapula’s portion of the shoulder socket) to point upward. It is this positioning of the glenoid fossa which makes it easier to bring the arm overhead, making for a stronger foundational position in headstand, forearm stand or handstand. You may be thinking, “well, that is obvious”. And you are right. However, there are a lot of yogis and yoginis whose serratus anterior are contracted and weak and unable to maintain their arm in an overhead position, leaving them prone to unfortunate dysfunction of their shoulder girdle which can lead to neck pain, elbow pain and wrist pain. Here is a simple exercise that is fun for exploring the functioning of the serratus anterior. Before doing it, be aware that if you are contracted and weak in your serratus anterior, there is a good possibility that more is going on with your shoulder girdle. If you experience pain/strain in your neck, wrists or elbows when doing any inversions visit with a manual physiotherapist or chiropractor. On all fours, on your hands and knees, connect and root through one hand. Raise the opposite arm, elbow straight toward your ear. Notice if your elbow bends or if you raise your torso into a twist or into another awkward movement. Only your arm ought to move. Explore for a few rounds and switch sides.